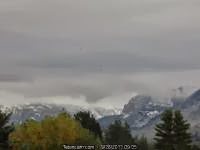 From Jack Hales webcam board - view of the Tetons in Wyoming this morning - September 28th. Here at the house the low temperature this morning was 45 F - 10 degrees colder than the grid point forecast for here of 55 F. The airport recorded a low of 57 F.
Empire (at 4650 ft MSL) 43 F - morning lows here at house are often very close to those recorded at Empire although there is about 2400 ft difference in elevation. 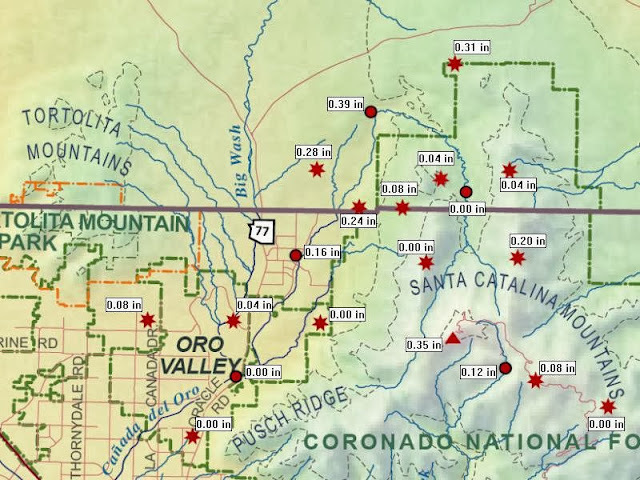 So many of the high elevation RAWS sites were fairly warm. But between here and Sollers there is a foothills banana belt with warmer readings - for example Saguaro RAWS near Sabino Canyon had a low of 53 F.
Pacific cold front moving across southern Arizona today with bands of heavy, low clouds. View of Catalinas above was at 7 am MST and visible satellite image below was from 8 am. There have been some very light showers in the mountains, with one station in the Catalinas reporting 0.04". Winds yesterday ahead of the front gusted from 40 to 60 mph over much of eastern and northern Arizona. The 12 UTC morning sounding (above) at Tucson shows increased moisture in low-levels but CAPE is limited to a shallow layer below 650 mb, due to the very strong temperature inversion there. Thus, not much chance of showers except on the mountains. Looks like September will close out very dry for southern Arizona - there was only rainfall here at house on 4 days, with the last one of those days being the 9th. Another 500 mb short wave will be moving across the West tomorrow and tomorrow night. Moisture with this system stays far to the north but winds will kick up again across Arizona. Graphic above shows this morning's NAM forecast, at 500 mb, valid at 2 pm MST tomorrow afternoon (Thursday, 26 September). The early WRF-NAM forecast of 10-m winds on the 5.4 km grid, valid at the same time, is shown below. More cool mornings behind this system for the weekend. Lows the last three mornings here at house have been 54 to 56 F - very pleasant. Katie gave a talk in Albuquerque yesterday afternoon and our quick trip over there proved to be quite an outing. 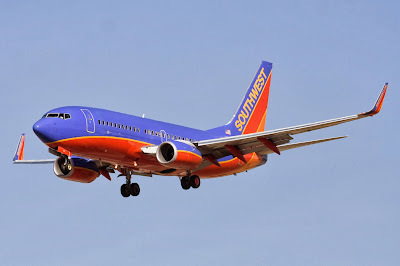 We used frequent flyer miles on Southwest Airlines (one of their fleet of 737s above) to book our trip. Unfortunately, Southwest had eliminated the several flights it had had between Tucson (TUS) and Albuquerque (ABQ) a month or so ago. I considered setting the trip up so that we'd drive to and from Phoenix, where there are many more direct options. But no.... So we were scheduled to fly from Tucson to Los Angeles (LAX) and then on to ABQ on Saturday morning and to return on Sunday afternoon with a flight to San Diego (SAN) and then on to TUS. The short version of this story is that we actually flew on none of these flights! On Saturday morning the flight to LAX was delayed because of marine-layer fog and low visibility (why was LAX located right at the ocean?). The delay extended so long that we could no longer make our connection to ABQ, and Southwest folks rerouted us on a flight to Las Vegas (LAS) and then a connection to ABQ. This worked but got us in a couple of hours late. It was a very windy weekend across most of the Southwest and our landing was very rough at ABQ. There was a head wind component but also a fairly strong cross wind component and the pilot landed very "hot", but mostly fell out of the sky the last 100 feet or so. Welcome to Albuquerque. Talk went well yesterday and then we headed for home. But now the short wave (see several previous posts) was approaching ABQ. We were scheduled for a 6:25 pm MDT departure. But a line of thunderstorms had developed and was moving in from the south-southwest (above is 6 pm MDT radar from NCAR RAL) - the NWS ABQ radar is at the plus sign and is located about 20 miles west-northwest of the airport. 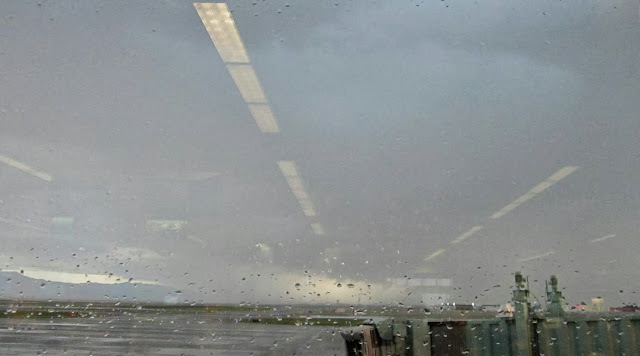 These storms intensified and moved in rapidly - below is a not-very-good photo of their approach from the concourse at a bit after 6 pm MDT. The heavy rain with the storm, and frequent lightning, shut the airport down and the plane that was to head on to SAN from ABQ had to land at El Paso. It became clear that this plane would not make it up to ABQ and then on to SAN in time for our connection to the last SAN-TUS flight of the day. Southwest could book us on a flight to Phoenix (PHX), and we decided on this option, since Katie really needed to be back at the University this morning (they did also offer overnight accommodations and flights back this morning). A trailing line of thunderstorms developed (below is regional radar at 8 pm MDT) and these storms delayed the flight to PHX by about another 2 hours. 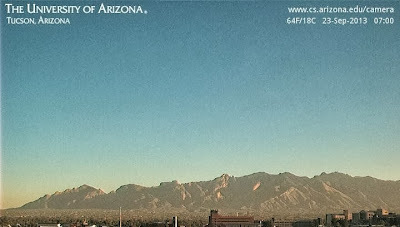 We did eventually get to PHX; rented a car: and arrived home after midnight. Very tired, but glad not to be in a hotel in ABQ. We started out the day today having to return the rental car and retrieve my car from the airport parking lot. So it goes. I think this story illuminates what the future may hold for many of us, as the airlines reduce service and flights to mid-sized cities and completely eliminate flights to smaller cities. Not a pretty picture. We've been away this weekend in Albuquerque and our trip was much impacted by the strong 500 mb short wave that was crossing the Southwest. More on this later. Rain gauge here dry and dusty this morning but wind blown debris in car port and on front porch. Low temperature this morning a cool 56 F here at the house. It looks like winds generally gusted yesterday from 30 to 55 mph across Arizona, with strongest gusts up in the northeast part of state. 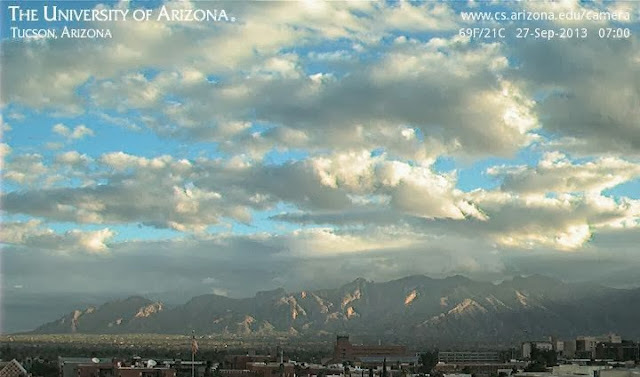 Campus webcam view of the Catalinas (above) at 7 am this morning (Monday, 23 September 2013) shows some dust suspended in the air. View at 11 am MST yesterday captured heavy clouds and some showers moving through with the short wave. Quite a bit of lightning yesterday from edge of Pima County eastward. Above shows CGs from yesterday afternoon through midnight last night. For today, the early WRF forecasts from Atmo indicate some showers and perhaps a thunderstorm for eastern Pima County. Above is composite radar forecast from GFS version valid at 6 pm this evening. Below is GFS forecast of rainfall amounts through midnight tonight - night much forecast in way of rain on the ground. The NAM version is similar in placement but with less shower activity and much less rainfall. Looks like Fall is on its way and soon I'll be noting how much cooler it was down here near the Rillito than at the airport. Thunderstorms developed quickly today - I could see raining falling on the Rincons a bit before 11 am MST. The above shows TUS radar composite chart at 1:37 pm and below is same at 3:37 pm. Looks like Art Douglas may be experiencing a heavy storm down at Ash canyon! Lightning strikes during the 6 hours ending at 3 pm are shown in bottom graphic. But, only 3 sites along east edge of the ALERT network have had rainfall during past 6 hours. The current NAM forecasts this morning bring the Pacific short-wave at 500 mb into the Southwest by Sunday morning (Sep. 22nd) - The forecasts above (500 mb) and below (700 mb) are valid at 5 am MST Sunday morning. Ahead of the 500 mb short wave the height gradients and winds at 700 mb become quite strong over northern Arizona, southern Nevada, and Utah. The early WRF-GFS forecasts of 10 m winds across the Southwest indicate the possibility of a significant wind storm across the region. The forecast above on the 5.4 km grid is valid Saturday afternoon at 3 pm MST, and the forecast below is valid at 2 pm Sunday afternoon. Below is the 10 m wind forecast valid at 2 pm Sunday from the 1.8 km grid. Very strong winds impact much of the Great Basin and Rim country as well Interstates 15, 70, and 40. Cross winds, if the forecasts verify, would be particularly strong along I-40. Blowing dust probable for areas that remained dry during last week's storms. There are a number of interesting things evolving in the weather situation as a fairly strong, Fall-like trough approaches the west coast. 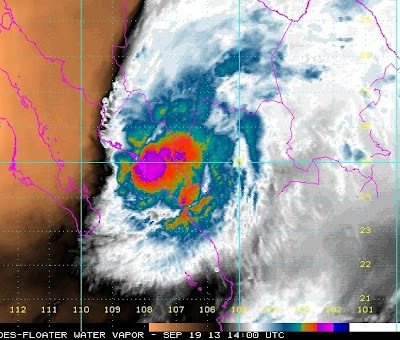 Once Hurricane Manuel weakened, the storm moved rapidly eastward into north-central Mexico and on toward southwest Texas. Manuel has produced a significant disaster in Mexico, with over 100 deaths being reported now and many more missing in the floods and landslides. Manuel moved off in exactly the opposite direction of the early NHC forecasts after the storm re-formed south of the GoC. Graphic below shows CG lightning strikes for the 12-hours ending at 11 pm MST last night - storm activity north of Manuel and from near the Continental Divide eastward. This morning's 12 UTC sounding at TUS (above) indicates that PW is currently less than an inch; however, the SPC diagnostics forecast some CAPE this afternoon. The ugly, strong inversion just above 600 mb remains and is a significant deterrent for deep convection, as is the very dry upper-troposphere. The early WRF forecasts are quite similar for both versions this morning - below is PW forecast by WRF-NAM on the 5.4 km grid valid at 7 pm this evening. Note that the model brings higher PW in from the east and south, with values well over an inch by evening. The models weaken the inversion very substantially (may be over-done) and forecast storms for eastern Pima County this afternoon and evening. Above is WRF-NAM forecast on the 1.8 km grid of composite radar echoes valid at 2 pm MST this afternoon. The WRF models forecast today to be the most active day, with only some light shower activity for eastern Pima County tomorrow. The outcomes will depend upon the low-level moisture advection that actually occurs and whether the inversion weakens later today. On Saturday night and Sunday the models forecast a significant dry out from the south-southwest to march across the state in advance of the Pacific trough - below is PW forecast on the 5.4 km grid valid at noon on Sunday the 22nd. 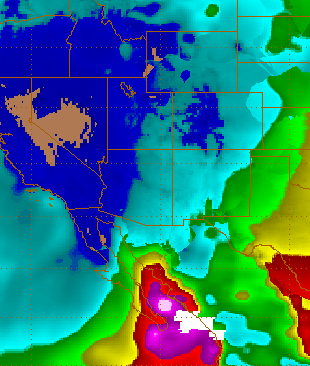 The color bar to right indicates that PW is forecast well below 10 mm across most of Arizona on Sunday. The models also forecast a very significant wind storm with the Pacific trough, and I'll cover that in a separate post. Early this morning the NHC was still calling Manuel a hurricane. It appears that it will weaken rapidly during the day today. 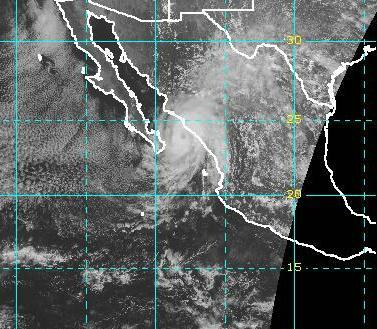 The storm is nearly stationary in the southern Gulf of California (GoC). Above is NHC position estimate at around 5 am MST today and below is a water vapor image from 7 am. The storm has produced a serious disaster in western Mexico with great damage and many deaths from heavy rains and floods. A large MCS developed yesterday during the afternoon well to the north of the hurricane. This MCS moved northward, producing numerous lightning strikes - CG plot above is for 12-hours ending at 2 am this morning. 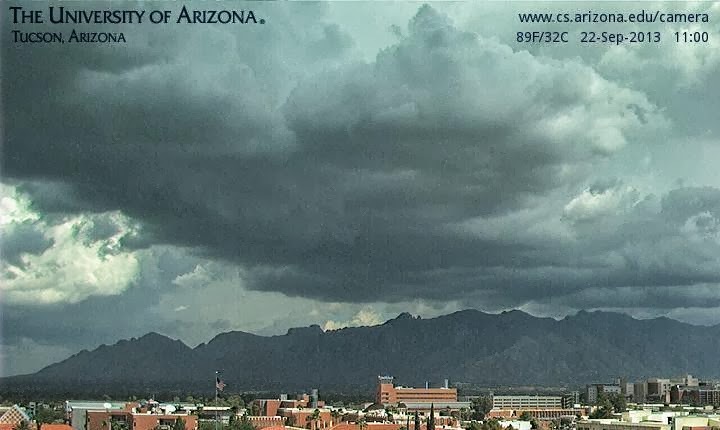 Storms in Arizona remained northeast of the Tucson area, along the New Mexico border. The early morning WRF forecasts from Atmo continue to forecast some showers and storms over eastern Pima County tomorrow and Saturday - above is early WRF-NAM forecast for radar echoes valid at 3 pm tomorrow. The middle levels continue very warm, although there has been a bit a bit of cooling relative to yesterday, essentially limiting the development of deep convection. Both versions of the model continue to move increased PW amounts up the GoC and into southern Arizona - below is forecast of PW valid at 5 pm MST on Saturday afternoon. So, at least some slight possibility that ingredients will come together for a brief transition event over southeastern Arizona. TS Manuel has intensified to near hurricane strength over the southern GoC this afternoon. The NHC now forecasts a slow motion to the north and has issued hurricane warnings (see above) for part of the east coast of the Gulf. The 1 pm MST visible image below shows a large but distinct eye with the storm. The fact that Manuel is intensifying and staying over the GoC complicates the low-level moisture situation. Right now the pressure gradient is down-the-Gulf toward the storm, which will take dry air further south. However, there is an up-the-Gulf pressure gradient at the north end - above is surface plot at about 1:30 pm - as the short wave at 500 mb moves across the Great Basin. There is a battle among very dry, dry, and very moist air masses underway. It is likely that low-level moisture will increase across southeastern Arizona during the rest of the week. But, the warm air suppression at middle-levels continues very strong, with 500 mb temperatures today just below zero - ugh. The 12 UTC WRF forecasts have backed off on the convective forecasts for today and tomorrow, keeping storms to the east of Pima County. Still need to keep a wary eye on Manuel and the high moisture over the GoC. GENERALLY BE A FEW DEGREES ABOVE NORMAL INTO THE WEEKEND. At this time Manuel has become a TD again and is located at the southern end of the GoC. Current position of Manuel from the NHC (above) with the new forecast shown below. Manuel is forecast to strengthen again to become a Tropical Storm and to move northwestward into the GoC, before turning west across southern Baja. Tropical Storm watches have been issued - shown in yellow below. 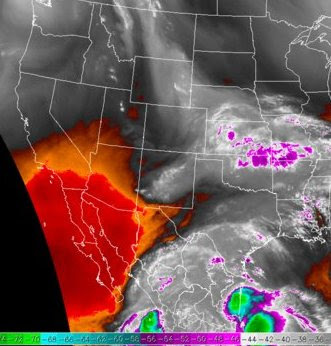 Water vapor image from 1 pm MST is shown above, indicating deep convection associated with the re-invigorated system. The WRF forecasts today indicate chances for storms in eastern Pima County with the 12 UTC WRF-GFS starting activity tomorrow and the early WRF-NAM holding off until Thursday. Both versions of the model forecast a significant surge of mT air northward as Manuel crosses the southern GoC. The forecast below is from the 12 UTC WRF-GFS at 5.4 km grid and indicates the moist air taking an overland route directly into south-central Arizona. So, we need to keep a close weather watch to the south during the middle of this week. East winds with gusts of 15 to 20 mph continued through the night, and it was another very warm morning here in Tucson (yesterday had a low of 80 F and high of 101 F at the airport). A couple of thunderstorms managed to get going near mountains yesterday. Above is TUS composite radar at about 1:30 pm MST and below shows lightning strikes detected during the 24-hours ending at 5 am this morning (I've zoomed in to focus on Pima County). 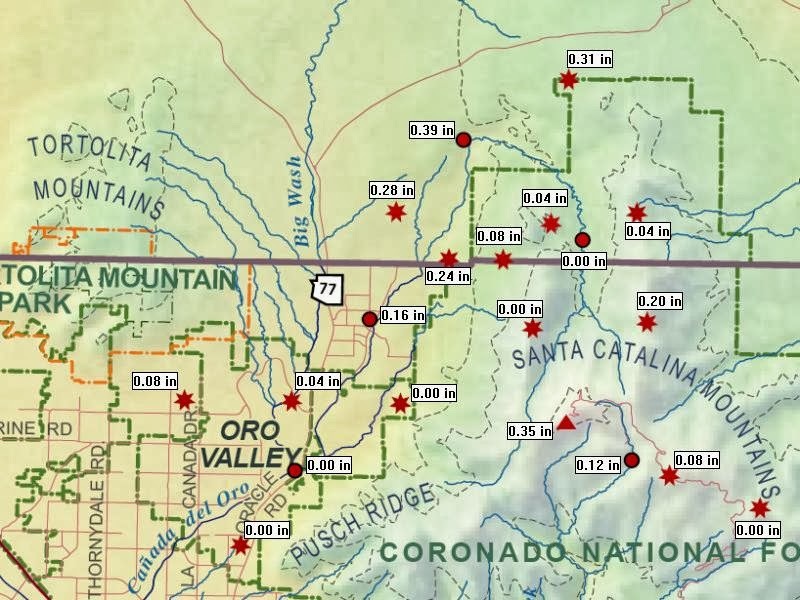 Two stations in the ALERT network reported rainfall yesterday afternoon - White Tail in the Catalinas had 0.04" and Picture Rocks at the north end of the Tucson Mountains reported 0.14" - nothing here at house for over a week now. Low-level moisture continues to hold across much of southern Arizona, but the upper portion (above 600 mb) of the troposphere remains very dry and even warmer this morning. There is a very ugly inversion in this morning's sounding just below 500 mb. Both early forecasts of the WRF model at Atmo forecast only some moderate cumulus over eastern Pima County this afternoon. Below is the forecast TUS sounding from the WRF-NAM valid at 4 pm MST this afternoon. It is an interesting sounding with CAPE present - but only above the warm middle-level layer. Release of this CAPE would require boundary layer parcels to be lifted from 600 mb up to around 400 mb - certainly a very long-shot given the hostile shear and dry air in this layer. Both models do indicate a chance for increased activity by Thursday, as a 500 mb trough moves from the west coast across the Great Basin, affecting Arizona. Perhaps the trough will bring some middle-level cooling with it? Moisture holding on below 600 mb. The easterly wind during the night and early morning kept temperatures quite warm at sunrise. Low of around 80 F was almost 10 F warmer than yesterday morning at the airport. Tucson's morning sounding (above) continues to have a bit of CAPE at lower levels, but very dry upper-troposphere (see 7 am water vapor image below) and warm air around 500 mb are keeping deep convection off to the east in Cochise County. The early run of the WRF-NAM forecasts some storms this afternoon and evening in eastern Pima County, but overall it's a hostile situation with east winds adding to the negatives. Moisture continues to be higher from the east to the south and flow below 600 mb keeps trying to move this moisture toward southeast Arizona, and the battle zone continues to be nearly overhead. 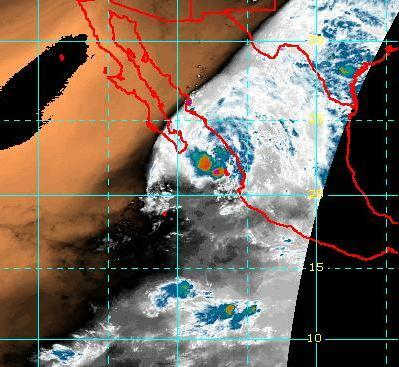 Large areas of deep convection and heavy rains are associated with the tropical systems on both coasts of Mexico. Floods produced by TS Manuel have caused a number of casualties in western Mexico. 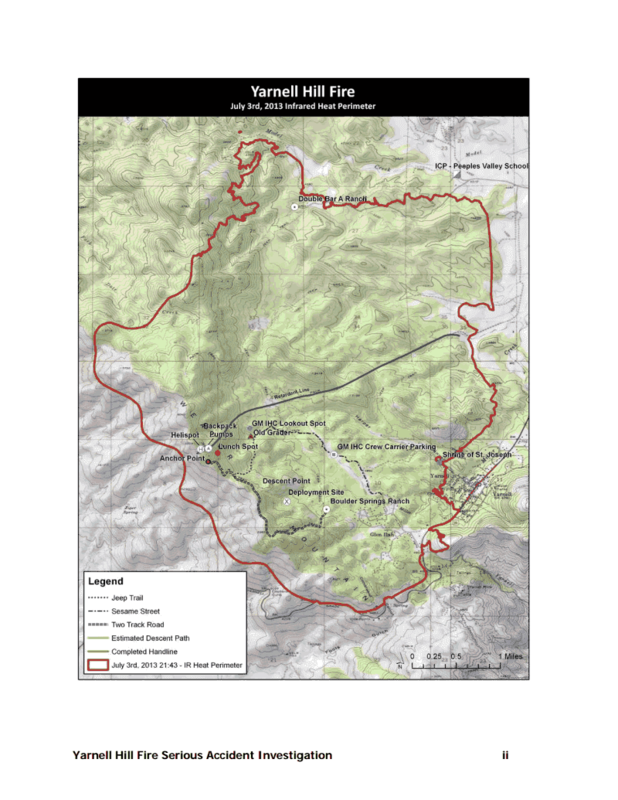 End Of Summer Storms At Low Elevations? More Storms Than Early WRF Indicated!